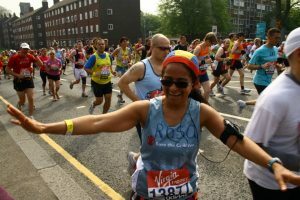 We’ve put together some training plans for you for this year’s London and the Brighton marathons. Our aim is to have a plan that will get you round in a great time but will also mean you have plenty of people to run with for some of those tougher sessions. The training plans are tried and tested and have helped club members achieve marathon goals ranging from 2:45 to 4 hours. You can see the schedules here. There is one for London and two for Brighton. The only difference between the two Brighton schedules is that one assumes you have already been building up your long runs and the other assumes you have been chilling out a bit over Christmas. If you would like to follow the schedules, then there are a couple of events you should book and dates to put in your diary. For Brighton runners: there is a recommended half marathon the Thames Meander on Saturday the 11th of March. Also the week after, on the 19 March there is a 20 miler scheduled and we thought it would be nice if we ran this together from Richmond back to Kentish Town. For London runners: the Paddock Wood half marathon is recommended on the 2nd April. We’ve also put down the Gade Valley 20 mile training run on the 26 Mar. This is a lovely marathon prep event organized by Gade Valley Harriers. Entry is on the day only for £10 and they give you some tea and cake for that. For everyone: The schedules recommend that you do the Fred Hughes 10 mile race in St Albans and, if you choose to have Saturday sessions in your schedule, they recommend the South of England Cross Country championships. Unfortunately, these events are already full. If you’re not signed up, instead of the Fred Hughes 10 mile you could do a 2hr long easy run instead or perhaps a half marathon such as the Farnborough Winter Half. Similarly a 40 minute continuous hill run would be a good replacement for the Southerns. Disclaimer: This is a blog. The views expressed are the coach's own and represent their opinions at the time of posting. The information in this blog is provided on an as-is basis. The advice given is not warranteed and should only be taken at your own risk.